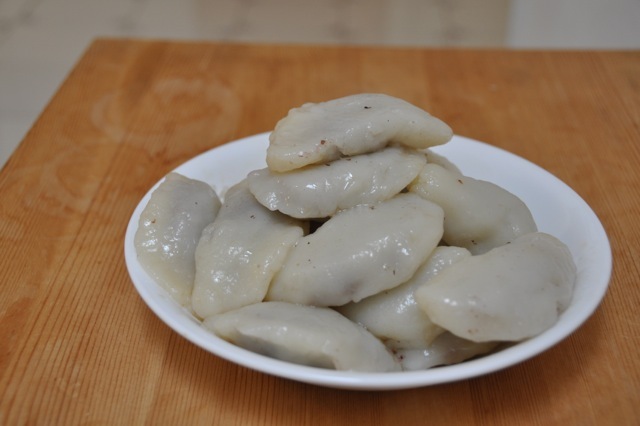 I don’t mean to sound like a broken record, but I really really love 떡, tteok. I especially love it when I can find it fresh, in long, thick strips, like I did at Hansol Party House at 160-28 Northern Boulevard in Flushing, Queens. A big 2-3 lb. package normally costs $7, but the lady insisted on charging us only $5 because she said there was a little too much water in it that day. She said it would be fine for eating fresh that day, whether pan-fried or sautéed as tteokbokki, but that it would fall apart if I put it in soup for tteok-guk. I love it when people have such pride in their work, they have to acknowledge when they’re not at their best. I was planning to pan fry it for my favorite breakfast. There’s nothing you have to do, other than cut it into manageable pieces, as much as you think want to eat, and then heat some oil in a pan and drop it in. As it fries, it’ll form a lovely, crunchy golden crust while the inside gets warmer and softer. You can turn it around and around for an even glow. Then you can dip it in soy sauce with a little vinegar, sesame oil, and a pinch of crushed red pepper. Or you can dip it in honey. Garaetteok is such a versatile ingredient. It can go into tteokbokki, it can go into soup, it can thicken up spicy chicken dakgalbi. It can even be made into tteok ‘n cheese, a dish I imagined and my friends executed for a dinner in the Bay Area. I didn’t get to taste it, but I heard it was a huge hit. But when it’s as good as the stuff from Hansol Party House, it doesn’t need anything else. I almost forgot about the rice cake soup on Sunday night. I had decided to reprise the fried chicken, in honor of my friend Sharon’s visit from New Haven, and given how long it takes to fry 5 pounds of fried chicken plus the amount of food we’d already eaten, it wasn’t surprising I forgot about the beef broth just simmering at the back of the stove. When I finally did get around to serving it, it was warmly appreciated it, the way it always is. 떡국, tteok-guk, or rice cake soup, is one of the milder Korean soups. There’s no fiery red pepper or fermented soybean paste in it. It’s just a beef broth in which ovals of sliced rice cakes are simmered until soft but still chewy, often along with some dumplings. On fancy occasions, it gets garnished with thinly fried eggs cut in elaborate diamonds or strips, shredded meat, and strips of roasted seaweed, for a very colorful presentation. But growing up, it was also what my mom made when she was pressed for time. She’d worked out an everyday version, in which she would sautee strips of beef in soy sauce and pour in some water for a surprisingly tasty broth. When the rice cakes were tender, she would break the eggs straight into the pot and stir it up into ribbons of white and yellow. I found tteok-guk boring and tiresome until I left home and realized there was nothing I would rather eat when I am tired or sad. Greens waiting to be tossed in a spicy-soy sauce-sesame oil dressing. Given how everyday it was in our house, though, I’d always wondered why rice cake soup is a celebratory food. It’s always served on New Year’s Day, and given that traditionally, Koreans celebrated turning one year older collectively on New Year’s as well, it’s a birthday soup, too. King oyster mushrooms tossed with shredded scallions--a big hit with the Koreans! It turns out, it’s all about rice. Even though rice is a central part of the Korean diet, it’s only recently that it’s become so common as to be a background food, something to eat with everything else on the table. For most of Korean history, it was too expensive to eat everyday. Most people ate barley or millet, sometimes mixed with rice, but often without even a grain of rice. In the north, noodles made out of buckwheat, arrowroot, or sweet potatoes were the common starch. So to take that precious rice, grind it into rice flour, and then make rice cakes out of it, which is no easy thing itself, that was the height of luxurious living. To eat like a king one day out of the year—what could be more celebratory? Now, it takes nothing to go to the store and buy a bag of pre-sliced rice cakes. We’ve lost something in not knowing what kind of labor it takes to grow rice and to pound it into chewy cakes. I wonder how it must have felt, to sit at a table on New Year’s waiting for your wonderful bowl of tteok-guk to appear. But I like to think that for those who appreciate good food, no matter how simple and easy and everyday, we will always recognize when we are eating like kings. This is a very simple write-up, as the amounts are still estimates and the final version will have some more detailed explanations. But if you get a chance, it’s a nice soup to eat in these last cool nights of spring. 4 tablespoons chopped green onions. 2. Take the brisket out and let it cool. When it’s cool enough to touch, shred it into thin pieces about 2-3 inches long. Toss the shredded brisket with the dark soy sauce, ground red pepper, chopped garlic and chopped green onions. Set aside. 3. Bring the broth back to a boil and then let it simmer. Season the broth with soup soy sauce. Taste as you go along, as the saltiness of soy sauces can vary a lot by brand. 4. Add the rice cakes. Simmer for 10 minutes. Taste and make sure that it’s soft. It should be tender but still chewy. 5. Add the shredded beef. Break the eggs into the pot and swirl with a pair of chopsticks. Let it simmer just a minute more for the eggs to set. 6. Ladle the soup into bowls. Garnish with thin strips of roasted seaweed and add freshly ground pepper before serving.